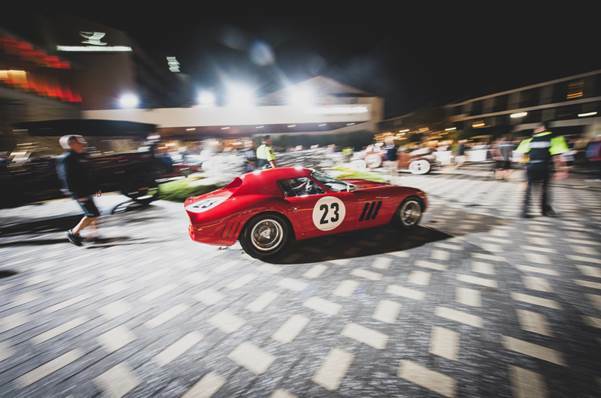 A rare and race winning 1962 Ferrari GTO, one of only 36 produced between 1962-64, sold for a record $48.4 million on Saturday evening in Monterey California at RM Sotheby’s premier car auction. Not surprisingly, the Ferrari marque holds eight of the top ten prices for automobiles sold at auction. It was also no surprise that the iconic car sold within its $45-60 million pre-sale estimate since it was backed by an otherwise undisclosed financial guarantee. For non-enthusiasts, GTO stands for Gran Turismo Omologato, a racing classification for certain cars that are ‘street legal’ though really built in limited numbers as race cars. It didn’t hurt the sales room theatrics as five- time Le Mans’ winner Derek Bell drove the Ferrari across the auction block in the packed sales room at the Monterey Conference Center immediately before the sale, no doubt further whetting anticipation of a record performance. Three anonymous telephone bidders chased the lightning fast prize, with bidding opening at $35 million and moving along at one million dollar increments and under until the winning hammer price of $44 million (before the tacked on buyer’s premium). RM Sotheby’s set strict requirements for bidding on its star entry, forbidding internet bidding and requiring interested parties to go through a pre-sale vetting process in order to avoid payment unpleasantries. It has been widely reported that auction houses have encountered problems with Overseas, Chinese ‘buyers’ who win bidding battles but duck out on the payment. Seattle based tech pioneer at Microsoft and vintage car racer Dr. Gregory Whitten was the seller who acquired the GTO privately for an undisclosed price in 2000. It could have traded in the $10 million region at the time and no doubt represents a handsome windfall for the seller. RM Sotheby’s didn’t identify the buyer or even indicate what part of the world he or she hails from. Though expertly marketed by RM Sotheby’s, characterizing it as “the Holy Grail of the collector car world,” the auction price still trails the reported $70 million private sale of a 1963 GTO earlier this summer that sold to Weather Tech founder and CEO David Mac Neil. Akin to a rare painting, Whitten’s GTO carries a stellar provenance lineage with an early Italian owner and car racer, Eduardo Lualdi-Gabardi who was friends with marque founder Enzo Ferrari and later, Lord Anthony Bamford, a storied car collector and racer, followed by Japanese blue jean tycoon Yoshiyuki Hayashi and L’oreal ceo Sir Lindsay Owen-Jones. Whitten was next in line. 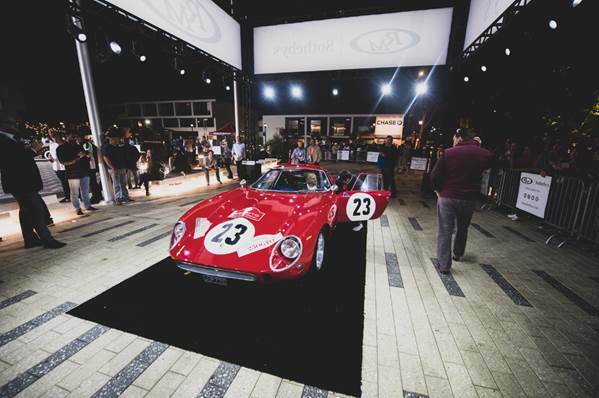 There was plenty of other action over the long weekend in Monterey and Pebble Beach, with another RM Sotheby’s entry, the one-off, rigorously restored 1963 Aston Martin DP215 Grand Touring Competition Prototype that made $21,244,000 on Friday evening (est. $18-22 million). It too was backed by a financial guarantee, copying in part the big-time insured stakes of a fine art auction. 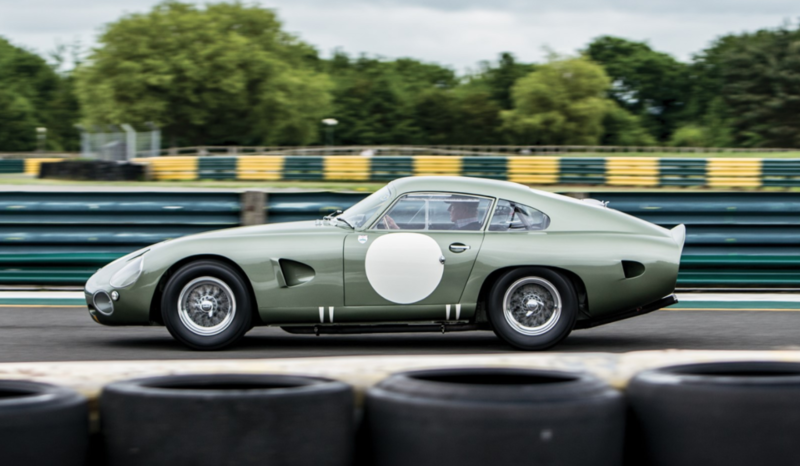 The Aston came close to beating the record $22.55 million won by the impressively race seasoned 1956 Aston Martin DBR 1 that sold at RM Sotheby’s in Monterey last summer, also the most expensive British car ever to sell at auction. In that same competitive vein, but without any special financial guarantees, a gold-hued, 1966, Ford GT40 MK II, that came in third, overall at the 1966 Le Mans 24 Hours endurance race, accelerated to $9,795,000 million (est. $9-12 million). 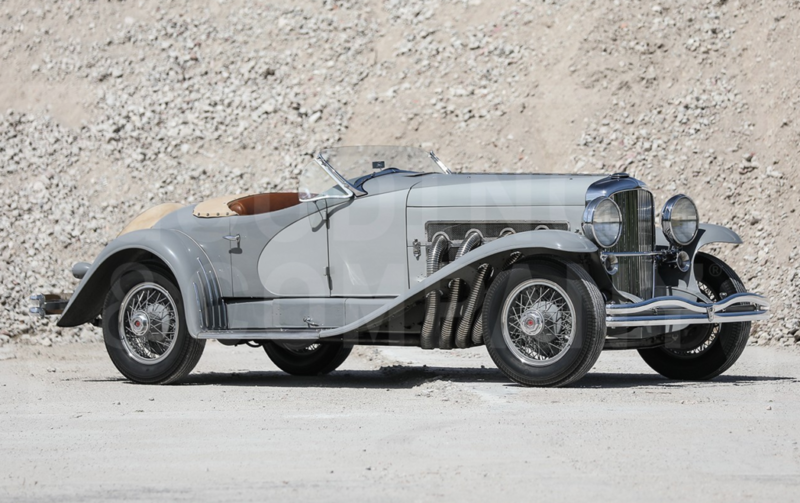 In a slower but no less spectacular lane, a super-charged, 1935 Duesenberg SSJ La Grande Roadster, sporting wire wheels and elegant lines, made a record $22 million at Gooding & Company at Pebble Beach, making it the most expensive American car ever sold at auction as well as the most expensive Pre-war car at auction. With fees, it doubled its low estimate. 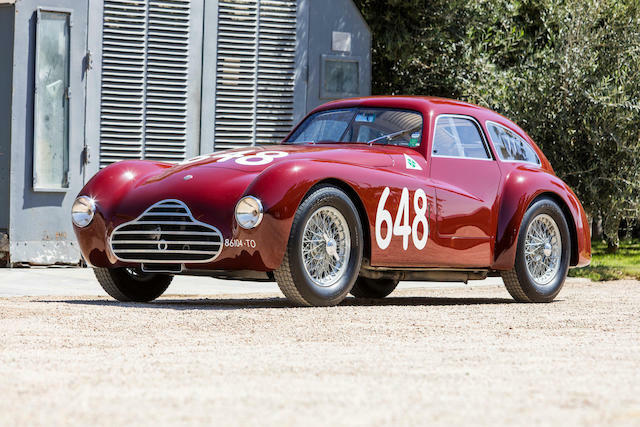 Further down the price line food chain, a gorgeous and aerodynamic 1948 Alfa Romeo 6C 2500 Competizione Coupe sold for $3.52 million at Bonhams’ Quail Lodge auction in Carmel. Though full statistics from the auction houses are still trickling in, it is evident that the current market, at least at the tippy-top, continues to be obsessed and driven by race-proven, provenance strutting classic cars, akin at times to the rigid requirements of educated and deep-pocketed collectors of Modern and Post-War Art. The big question remains, would you rather own a museum proven Amedeo Modigliani or a Pablo Picasso? This entry was posted in Blog and tagged Alfa Romeo, Aston Martin, car auctions, David Mac Neil, Derek Bell, Eduardo Lualdi-Gabardi, Enzo Ferrari, Ferrari GTO, Gooding & Company, Gran Turismo Omologato, Lord Anthony Bamford, RM Sotheby's, Sergio Scaglietti, Sir Lindsay Owen-Jones, Yoshiyuki Hayashi. Bookmark the permalink.